Could it be that the Gunthers, John and his daughter Tanya, can perform the unthinkable -- sweep the Triple Crown with Justify, while breeding the first two finishers of the Belmont. Or they can possibly sweep the Triple Crown with two different horses they bred? Of course they want a Triple Crown sweep with Justify, but the possibilities are head spinning. And that is pretty much the story when it comes to handicapping the Belmont, of course, with a couple of twists. But first and foremost, I am sticking with my No. 1 ranked Kentucky Derby horse Vino Rosso, who had virtually no chance at Churchill Downs, returning after trudging through the slop with his eyes filled with mud. In fact, trainer Todd Pletcher said he has never had a horse come back from a race with so much mud in his eyes, and was still flushing them out the morning after the race. With lightly raced improving horses Hofburg and Tenfold likely to take money, and Gronkowski having his supporters based on his record and his illustrious namesake, Vino Rosso could be an enticing price. He is co-third choice at 8-1 on the morning line and will relish the mile and a half. There is not much to say about Justify that would prove enlightening, as everyone has already formed their opinion, whether they feel he is going to romp or fail in his attempt to sweep the Triple Crown. The case his dissenters make is that he showed in the Preakness he is starting to tail off after having crammed a lot into a short period of time. They also point out the lack of a 2-year-old foundation that they believe will catch up to him, and the fact that his pedigree does not exactly shout a mile and a half, even though he has already transcended his pedigree. But if you feel Justify is the proverbial man among boys and defies all history, which he has already proved, then you can make a case for the Belmont being his easiest race, as it was for other big strapping horses with enormous strides, such as Secretariat, Risen Star, Point Given, and Easy Goer. Just like these exceptional horses, Justify should relish Belmont's big sweeping turns. And all four either won the Preakness by 2 1/2 lengths or less or didn't win it at all. Yet that didn't stop them from winning the Belmont by 31 lengths, 14 3/4 lengths, 12 1/4 lengths, and eight lengths, respectively. As of this writing, it looks as if we amazingly could be dealing with our third off track, which would be unprecedented in Triple Crown history. Although Justify won the Derby and Preakness in the slop, the feeling here is that he is far superior on a fast track. Unfortunately, if the forecast holds true we'll never know what he might be capable of going a mile and a half on a fast track. Whether you like Justify or not, the way to go looks to be a trifecta box. This way, even if he wins, you have a chance of landing a longshot or two on the back end. And if he loses, then you have a chance to cash in big-time. So now we have to look beyond Justify and Vino Rosso. Having spent time recently with Hofburg at Saratoga, I am extremely impressed with him, especially his class and raw ability. He had to be special to run such a big race in the Florida Derby in only his third career start. With the Derby debacle under him, Bill Mott looks to have him peaking for the Belmont. 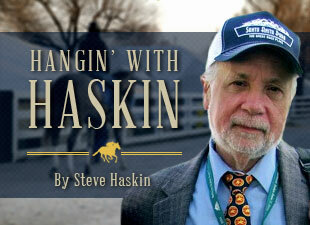 For those who missed my recent column on Hofburg, here is the way I saw his Kentucky Derby performance. After brushing with Lone Sailor coming of the gate, he was steered to the inside by jockey Irad Ortiz Jr. Racing near the back of the pack into the backstretch, he had Lone Sailor to his inside on the rail, with Audible about three-quarters of a length ahead to his outside. But Lone Sailor and Audible came together just enough to force Hofburg to lose his position, and he now found himself three lengths behind Lone Sailor, with only two horses behind him. All he could see ahead of him were a cluster of hooves spraying back sheets of mud. But as he began to move up, Ortiz saw that Lone Sailor had the rail occupied and was showing no signs of giving it up, so he moved him out and began looking for room between horses. But there wasn’t enough space between Lone Sailor and a tiring Mendelssohn, so Ortiz kept moving him out farther, just waiting for an inviting hole. That hole seemed to appear between Mendelssohn and Combatant at the five-sixteenths pole, but it quickly closed and Ortiz was forced to steady and keep looking. By now, Hofburg was out of the race way at the back of the pack. Turning for home, Hofburg got bumped around by Combatant and Magnum Moon, and Ortiz finally gave up and just steered the colt to the far outside, out in the middle of the track. He knew he had no chance to win or even finish in the money, but at least this way he would have a clear run to the wire. Hofburg, although still back in 13th at the eighth pole, more than 18 lengths off the lead, leveled off and was striding out strongly through the stretch. He crossed the finish line in 7th, beaten 8 3/4 lengths (he was sixth one jump past the wire), a terrific showing for such an inexperienced colt who had to overcome a less than ideal trip stuck at the back of the pack in the slop. Among the 13 horses behind him were the winners of the Arkansas Derby, Louisiana Derby, UAE Derby, Wood Memorial, Fountain of Youth, San Felipe, Rebel, and Gotham, as well as the runners-up in the Santa Anita Derby, Wood Memorial and Louisiana Derby. If you watch the NBC replay of the race, the camera zooms in on a close-up of Justify galloping out shortly after the wire. Watch the left part of your screen and you will see the white, green, and pink colors of Juddmonte fly into the picture and blow right past Justify, disappearing just as quickly off the right part of your screen. Yes, it was after a mile and a quarter, but Hofburg, once in the clear after all his travail, was just beginning to run. For a horse with only three career starts to endure such an eventful trip and still be coming fast at the finish, shows a lot about the horse. According to Riley Mott, who was with the colt after the race, he cooled out in 10 minutes after returning to the barn and was none the worse for wear, shrugging it all off like a true professional. So, there is no way I am not going to include Hofburg in the trifecta box. If you’re looking for a Belmont pedigree, his sire Tapit has sired three of the last four Belmont winners, his broodmare sire Touch Gold won the Belmont and he is inbred 3x3 to Belmont winner A.P. Indy. Note also that Vino Rosso’s second dam is also by Touch Gold. With Touch Gold being one of my all-time favorites, that is a strong connection with Hofburg. Now, you have to decide whether to go with a four-horse box or a five-horse box. My fourth horse is Tenfold because of the rapidity of his improvement. He, like Hofburg, looks to be a star in the making, and I love watching him on the track. He has the kind of swagger you look for in a good horse. Although he, again like Hofburg, should be at his very peak come Travers time, both horses are capable of running huge on Saturday on talent and pedigree. Right now I am leaning toward a four-horse box for $2. But if you want to add another horse and go with a $1 box, I would look at the early betting to see how Gronkowski is being played. I loved both his works since coming to America and you have to respect any horse that is big and strong, well bred, and riding a four-race winning streak. But his Thoro-Graph numbers are slow, and the horse that is showing steady improvement on Thoro-Graph is Blended Citizen. So, as of now, it is a four-horse trifecta box of Justify, Vino Rosso, Hofburg, and Tenfold. Oh, and don't forget your $2 win ticket on Justify.